On the nose, the sweet charabanc of sugar puffs, Crunchy-nut cornflakes, fudge cookies, honey and chocolate flapjacks collided into the savoury wall of smoky bacon crisps, barbecued prawns and baked ham. The palate was also a crash site – big, rich and chewy, with cinder toffee, spiced sultanas and dark honey on toast scattered in a frightening wreckage of charcoal, ash, liquorice sticks, peat reek and industrial garages. The reduced nose suggested a welder on a Calmac ferry enjoying a Daim Bar. 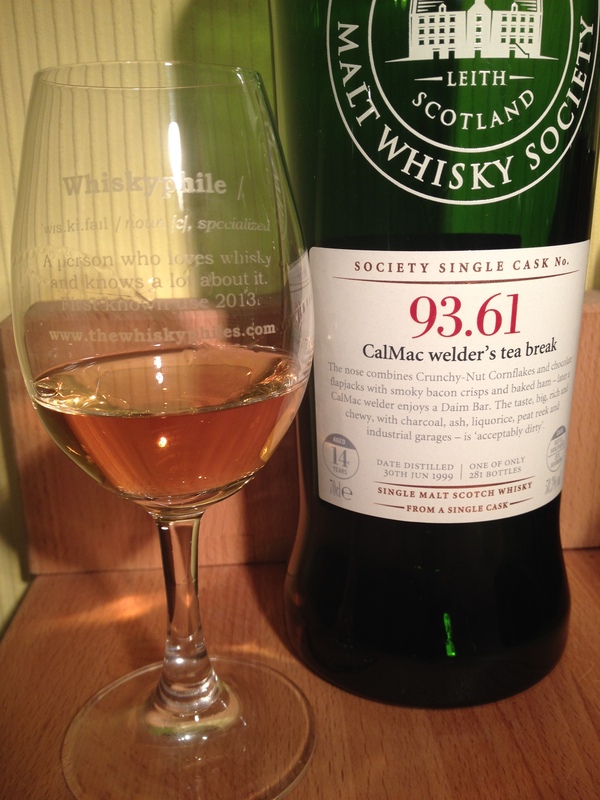 The palate – sweet and (we thought) acceptably dirty with a big spicy finish. From the ‘quiet outsider’ distillery in Campbeltown. Drinking tip: To aid the visceral enjoyment of a brutal rugby match. Hugely enjoyable dram, from the colour to the treacle-like sweetness on the palate, this is a wonderful single cask exampled from the Glen Scotia distillery.